Congratulations to Sean Byrne, Richard Spensley, Mike Horner & Richy Tough, who have been out with Bob this week and completed a days BikeWise Training. If you're thinking of a new bike and wonder how it might suit you for size then visit the site and enter your height, inside leg length etc and you will see how you might look and feel on it.You can even put your feet on the ground to see if you will be able to touch the ground. You can view multiple bikes at the same time and if the bike of your choice is not there, then you can notify the site and they will put it on for you. To take part in the run – Meet in DENHOLM GREEN for a 10.30am depart. Most day’s, before we go for a ride, it pays to check out the weather. We’ve put together a few of our favourite weather sites onto one page so that you can check the weather easily without having to search for three or four sites. metcheck, XCWeather.co.uk & RainToday are clickable links which will take you into their respective web pages. The other two are BBC weather and Met Office which show you local weather. Remember to ‘bookmark’ the page and it will hopefully be able to better prepare yourself for that next ride out in the sunshine !! Congratulations to Dawn & Stuart Proctor and Anita Craggs and John Whittle who have been out with Bob & Mick this week on a days BikeWise Training. Next meeting of the BikeWise Mini Bike Club will be on Sunday 28th August 2011. If club members have any doubts about the weather please check your emails or the website before travelling. BikeWise 2011 was the venue for two long serving members of Durham Advanced Motorcyclists to receive a token of thanks from the club in recognition of their hard work in helping to form DAM and making it such a successful club that we know today. 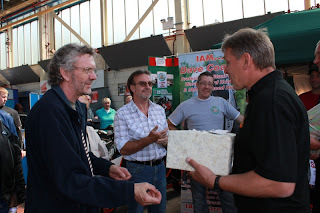 It was fitting that retired motorcycle Sgt, Bob Brown (BikeWise Training) who as our local IAM examiner, was instrumental with Mike Cope in forming the group in 1995, was able to present Mike with a gift from the committee. Mike has over the years performed allsorts of roles within the group both within Training and the Committee. John Cudden was one of the first to take his test with the newly formed group in 95/96 and went on to become an observer, senior observer and group training officer. Retired PC, Mick Alder (BikeWise Training) was the motorcycle instructor for the police and together with Ali Bonar worked closely with John on the Training side of DAM so Mick made the presentation to John on behalf of the committee. Photo’s are now online from this years BikeWise Show which was held in glorious sunshine at the Police HQ on Sunday 24th July. Many Thanks to the members of Durham Photographic Society who gave up their time to record the show for us in pictures. Click on this Link to go to the BikeWise photo gallery and from there you will need to click on the individual thumbnails to go into the individual albums. Hope you enjoy looking back on BikeWise 2011 and thanks for your support. Next years BikeWise 2012 show will be held earlier than normal due to the Olympics in London which will necessitate members of the team working down there for extended periods – so keep checking the website and we will publish the date as soon as we can.